A therapeutic exoskeleton is under development at USC to help people with diseases like muscular dystrophy to amplify their strength, and to help with rehabilitation and physical therapy. 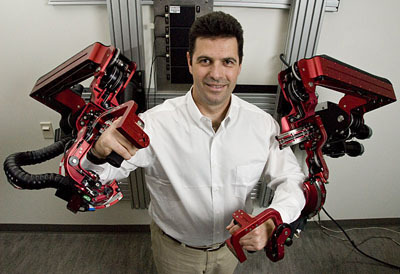 Rosen's current exoskeleton prototype, developed with a grant from the National Science Foundation, consists of two wearable robotic arms mounted on one wall of his UCSC laboratory. Inserting his arms into it, he notes that serious injury could result from a bad mismatch between the structure of the exoskeleton and the anatomical structure of the human arm. Two innovations distinguish Rosen's prototype from other exoskeleton designs. One is a special design of the exoskeleton arms that allows the user to reach 95 percent of the natural range of motion, or "workspace," of the human arm. The other, which is still the subject of active research, is a method for using neurological signals to control the exoskeleton. "By using the body's own control signals as input to the exoskeleton, you can achieve a natural control of the robot by the human operator as an extension of his or her body," Rosen said. The system uses noninvasive surface electromyography (EMG), in which surface electrodes placed on the skin detect neural activity in individual muscles or muscle groups. The system takes advantage of a natural physiological time delay between the neural activation of a muscle and the actual movement generated by contraction of the muscle. During that time delay, a computer algorithm can analyze and process the EMG signals, which are then fed into computer models of the muscular system along with additional information regarding joint position and velocity. The muscle models predict the joint movements that the operator's muscles will generate in response to the neural signals detected by EMG, and these predictions are then sent to the exoskeleton so that it moves in concert with the operator's arm. Fans of Fritz Lieber may recall the titanium exoskeleton from A Specter is Haunting Texas (1968), an interesting use of a medical exoskeleton.